The first of the rhubarb is here! 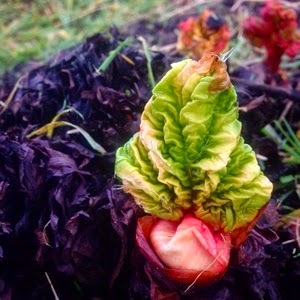 Rhubarb is usually the first food plant harvested on the allotment in mid April-May. However due to the mild weather our plot has grown an abundance of firm and glossy stalks already. The plant grows from the root at the return of warm weather. On February 15th the stalks started to sprout, and yesterday we picked our first bunch. We'll now harvest the stalks until July when the plant turns slightly poisonous. Pulling rhubarb much after that time will also weaken the crown, resulting in weedier stalks in later years. 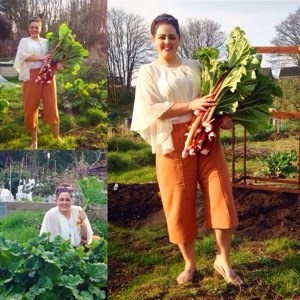 The colour of rhubarb stalks can vary from the commonly associated crimson red, through speckled light pink to simply light green. The colour varies according to both rhubarb variety and production technique. Contrary to popular belief, the colour is not related to its suitability for cooking - many believe pink stalks are sweeter.